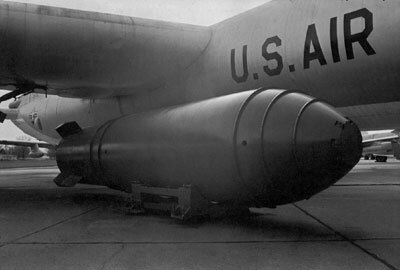 On March 1, 1954, in a test code-named “Bravo,” the United States tested the first droppable hydrogen bomb, the Mark 17. Its 15-megaton yield was equivalent to a thousand Hiroshima-type bombs. Some of the radioactive fallout—covering 7,000 square miles (over 11,000 sq. km. )—rained down upon 239 local Pacific islanders, 28 American observers, and 23 crewmen of the Japanese tuna trawler “Lucky Dragon No. 5.” When the vessel returned to its home port on March 14, several of the Japanese crewmen showed symptoms of “radiation sickness,” and one died on September 23. Many victims of the two 1945 atomic bombings readily identified with the new radiation victims. A coalition of peace groups in Hiroshima launched a campaign for one million signatures, and by August of that year the tally was 1,013,472 names (roughly half of Hiroshima Prefecture’s population at the time). City assemblies and citizens’ groups throughout the nation followed suit. The most startling, considering its small beginning and eventual massive outcome, was the “Suginami Appeal” issued by a group of ordinary women belonging to a book club formed in August 1953 in Tokyo’s Suginami ward. These women always carried a notebook for collecting names when shopping. 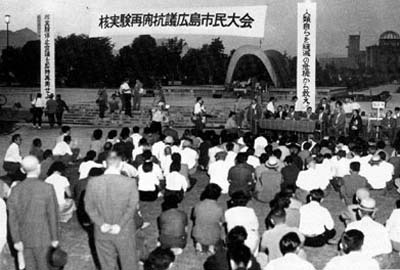 Their zeal inspired other citizens’ groups to join a nationwide Antinuclear Signature Campaign that, by November 1954, had collected 18 million signatures. This groundswell of public protest gave impetus to a Hiroshima proposal for a world-level rally—the first World Conference Against Atomic and Hydrogen Bombs. It opened in Hiroshima on August 6, 1955, with 30,000 participants joined by 54 persons from 12 countries. Subsequent world conferences heated up, as Britain and the Soviet Union also conducted successful atomic and hydrogen bomb tests. To cool this race, the U.S., U.S.S.R, and Britain signed the Limited Nuclear Test-ban Treaty in August 1963, which banned nuclear testing in the atmosphere, outer space, and underwater. France and China did not concur, and in any case, such showcase treaties have not proved successful in restraining the nuclear arms race. Competition and disagreements among international nuclear powers provoked considerable division of opinion and commitment among peace activists in Japan. Japan’s peace movement was thus strongly politicized by the international nuclear arms race, even with the success of citizen pressure in bringing about the first United Nations Special Session on Disarmament in 1977. Thus, concerned citizens sought additional ways to be active and effective. Concern in the two A-bomb cities had, in any case, always been centered on the fate of the A-bomb victims. “Easily forgotten” was the persistent fear of the peace commitment in Japan.